Traditional Use: Blue, or German, chamomile is widely known for its calming properties. Also known as German Chamomile. WARM HERBACEOUS WITH A WONDERFUL SCENT Very similar to the warm, herbal quality of chamomile tea. Add 3 drops to a hot bath for a blissful retreat. Blend small quantity with jojoba oil for a great massage rub. Chamomile Differences -Blue Chamomile essential oil has a high content of azulene, the active organic compound of chamomile, which bears a blue color. Azulene has anti-inflammatory, skin healing properties. This oil is most suitable as an ingredient for skin care products. 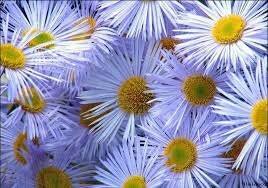 Blue chamomile is derived from the German chamomile plant, which is an upright growing annual. There are German chamomile plants that were breed for a high azulene content to use in the manufacturing of medicinal chamomile products. -Roman Chamomile essential oil is used for its skin healing properties in the manufacturing of body care products, as well as for aromatherapy. It has a very pleasant, soothing, apple-like aroma. The Roman chamomile plant is a low growing, perennial ground cover. -Moroccan Chamomile essential oil is not from a true chamomile plant. It is used mainly in perfume blends, and for aromatherapy. The plant is an annual that grows in the Mediterranean and in the Middle East. This is a product new to the market, it does not have a long history of traditional uses like true chamomile. Safety Data: May cause skin irritation. 1/2, 1 & 2 ounce sizes come in an amber bottle with black phenol cap with poly cone liner. Fragrance oils are commonly used to create body lotions, candles, and soaps, as well as perfumes and mists. When well-sealed and stored out of direct sunlight, a fragrance oil can have a shelf life of about one year, though many will last longer.